The Chrysanthemum and the Sweet Peas have now joined in the colourful fanfare, adding crimson, purple and white to the palette. The mystery Chrysanthemum is happily flowering in the shade. With this continuing heat and sunshine here in Cambridgeshire, England, the garden is seeing more and more flowers opening. Over the last few days I have watched the Chrysanthemum with its dark glossy leaves, send up its straight stems that have now burst into its annual show of white daisy-like flowers. This plant was another one that was already in the garden – it’s variety remains a mystery for now (any ideas – leave a comment below!). It seems to thrive in the shady part of the garden (it’s just a few feet away from the Fern). It’s white flowers, which seem to attract hoverflies, delivers a welcome contrast to the greenery that dominates the corner. 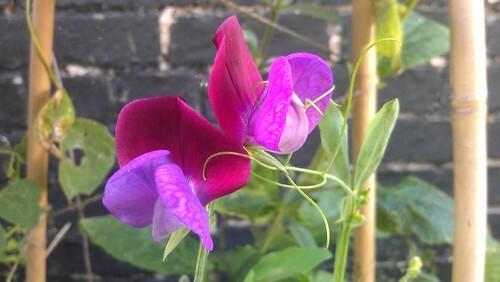 Elsewhere in the garden, the Sweet Pea ‘Cupani’ flowers have begun to open with their pungent crimson and purple flowers. The Sweet Peas are blooming, they just forgot to climb. Fortunately the Sweet Peas have eluded the aphids this year (which were probably blown and washed away a couple of weeks ago), leaving them with strong stems and early flowers. However, they haven’t exactly utilised the wigwams yet, despite some gentle woollen encouragement. They have been joined by the French Bean ‘Blue Lake’ which similarly have started flowering and again haven’t climbed very high.